We are location number on the Carroll county Map. 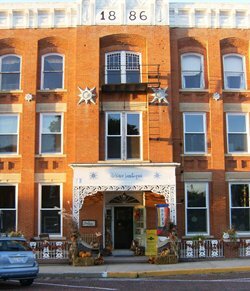 Our charming hotel is located in the Historic District in Mt. Carroll, Illinois. She was built in 1886 as a luxurious hotel and remained a working hotel until the late 70's. The Hotel Glenview is our home. And we've been working hard to make it your home, too. We are lovingly refurbishing some guest rooms, a couple of suites and even a couple of furnished apartments. We have two guest rooms and two furnished apartments ready & waiting for you. We call the Guest Room to the left, "Nancy's Room". It's a lovely room, overlooking the hotel's garden. The room to the right is Wes & Jill's Room. It's also a lovely room, overlooking the hotel's garden. 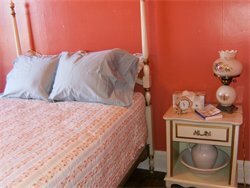 Both of our guest rooms have fabulous mattresses, 450-count 100% cotton sheets, four pillows & a comfy quilt. There are nightstands, chairs & sinks in each of the rooms, with a new water closet (toilet) and shower just across the hall.